The Portofino Experience by Keith Le Blanc. From the moment you arrive at Portofino Beach Resort, you notice something special. Your senses are aroused with the aroma of beautiful wild flowers blooming on the trees. You are greeted by a Belizean girl with eucalyptus scented towels served on a palm frond and soon after, greeted with a tropical drink while you wait for the room presentation. My fiancé and I took a trip to Ambergris Caye (pronounced “key”), San Pedro, Belize to find a resort to get married at in February of 2015. Online, Portofino ranked in our top five list of resorts to consider. It didn’t take long for Portofino to stand out head and shoulders above the rest of the resorts we visited. We travel quite often; so it is hard to impress us with scenery, accommodations and service, but Portofino Beach Resort delivered! Located just five miles north of the town of San Pedro, Portofino is only accessible via boat. Portofino also shares the same dock as Fido’s (pronounced “fee-dos”) restaurant and bar. Portofino can arrange for transportation to and from the airport in San Pedro or you can catch a cab to Fido’s for five dollars. We stayed in one of the colonial suites a few steps away from the pool. The room was very large and spacious. The room was so spacious that it could have doubled as a ballroom dance floor. The bedding was luxurious and extremely comfortable. After a massage on the beach a few steps away from the ocean, the bed will certainly become your best friend. Everything from the sheets and luxury duvet covers screams comfort and relaxation. Part of the room presentation is choosing two pieces of homemade soap. The aroma of the soap filled the room day and night which added to the sense of relaxation and ambiance of the room. Another wonderful perk was the turning down of your bed. After dinner we came back to our room and the bed was turned down, our robes laid out on the bed and a personal message from housekeeping written on a palapa leaf along with homemade cookies. We decided to eat dinner at the resort restaurant. The food was amazing! We were treated to a palate cleansing warm cauliflower drink before our meal. I don’t particularly care for cauliflower but I enjoyed the drink. I ordered a mix of lobster, fish and shrimp which was easily five star quality. Diane ordered a seafood pasta dish which I tasted and loved. The meal was so large that neither of us could finish our meal let alone dessert. If you choose to dine in town or at another resort, Portofino is wonderful at providing transportation via boat to the resort of your choosing. Just give them a time to pick you up and they will be there! Everything at Portofino is always in place and very well appointed. The grounds are well maintained, manicured and the beach is raked every morning. We noticed that at any given point in the day or evening, someone was raking the sand to and from the cabanas. You would be hard pressed to find footsteps in the sand anywhere on the property. Even though they were fully booked during our stay, the property at Portofino was very quiet and serene. Peace and quiet is certainly the theme here along with a backdrop of soft soothing sounds and scents inside and out. 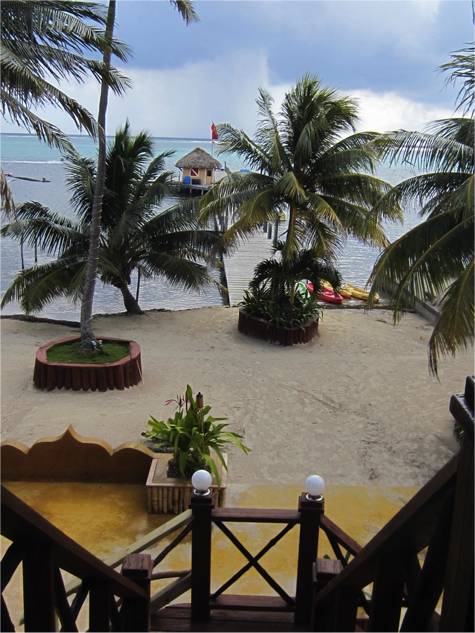 The resort offers free sea kayaks, bicycles and snorkeling equipment. Just check out what you like at the front desk and be on your way. A few of the guests mentioned that they saw more wildlife on the reef in front of Portofino than they saw on guided snorkeling tours. Along with the hammock on our cabana porch, you can also relax in a hammock over the ocean in front of the resort. If diving or excursions are what you are looking for, you can arrange day trips from the dive shop on the Portofino pier in front of the resort. One of the things we loved about Portofino is they didn’t allow pandering or vendors selling local wares to the guests. There was one person in front of the resort, but they were not allowed to approach the guests. If you want something, you can approach them, but they will never attempt to flag you down or call you over. This wasn’t the case at other resorts we visited. The employees at Portofino are really the cornerstone of Portofino Beach Resort. Most of the employees have been with the resort for ten plus years. They love the guests and go out of their way to memorize your name and where you are from on day one. We truly felt like family with all of the employees and owners. Most nights the owners will come to the bar around six pm to chat with the guests. They are a lot of fun and very outgoing. The resort was established in January of 2001 after hurricane Keith nearly wiped out the resort. The owners took a leap of faith moving from Belgium/Netherlands to purchase the property. The name Portofino translates to last port or as they put it, final destination. It took a lot of hard work and years to get the resort to the paradise it is today. Whether traveling from Europe or the United States, your expectations will be surpassed with the personal service and how the quests are made to feel special and well taken care of. You will be remembered. Your name will be remembered. 10th Wedding Anniversary in Paradise! Thank you for this awesome reflection on your trip! My fiancé and I will be there for our honeymoon in September. We are really looking forward to it! For our Travel Trade Partners!